TREASURE ISLAND, FL--(Marketwire - Feb 7, 2012) - Rock 'n' Roll runners, fans and support staff can navigate some comfortable accommodations for the inaugural St. Pete Rock 'N' Roll Half Marathon as beach hotels in St. Petersburg and nearby Treasure Island are gearing up for a full weekend of fun. Expecting 8,000 runners, the St. Petersburg, FL race is set for Sunday, February 12, 2012 as part of the world-renowned Rock 'N' Roll Half Marathon Series. Conveniently located to provide guests with easy access to Marathon events, the Residence Inn St. Petersburg Treasure Island hotel is a delightful choice among St. Petersburg, Florida beach hotels, and welcomes race participants with spacious suites and home-like comforts so they can relax easy after a hard workout, full day at the Health and Fitness Expo or a fun evening of networking with racing friends and acquaintances. Offering its guests exceptional amenities, race fans with accommodations at the Residence Inn can enjoy a complimentary full breakfast buffet at the hotel's Treasure Island, Florida location before heading out to the Health and Fitness Expo on Friday and Saturday at Tropicana Field. The Expo will feature official race merchandise and a variety of exhibitors displaying and selling health and fitness products, running apparel and footwear. The Expo will host a variety of clinics and speakers on topics of health and running. Runners will line-up on Sunday morning for the 7:30 a.m. start of the St. Pete Rock 'n' Roll Half Marathon, while a variety of festivities are planned for spectators including the Finish Line Festival at North Shore Park from 8:30 a.m. to noon and a nearby Spectator Block Party. A post-race concert featuring the Rap/Pop sensation Flo' Rida will conclude the Sunday festivities as part of the Finish Line Festival of events. As one of the premier hotels in Treasure Island, Florida, the Residence Inn provides guests with a choice of studio, one-, two- and three-bedroom suites, all designed with comfort and functionality in mind. High speed Internet access is complimentary and guests have access to this St. Petersburg Beach hotel's glimmering Treasure Island beachfront, heated outdoor pool, expansive fitness center, jogging/fitness trail and Sport Court®. To book accommodations race participants, enthusiasts and spectators may visit the hotel website at http://www.marriott.com/hotels/hotel-information/travel/tpati-residence-inn-st-petersburg-treasure-island/ and click on "Check Availability" for online reservations and additional information. The Residence Inn St. Petersburg Treasure Island hotel welcomes guests with a warm and friendly atmosphere and gracious accommodations for a relaxing tropical island experience. The hotel's spacious suites are ideal for family vacations, traveling with friends or extended-stay needs. 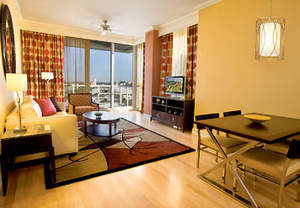 Suites also feature floor-to-ceiling patio doors to a private lanai overlooking Florida's pristine Gulf Coast. Evening socials and complimentary grocery shopping service allow guests the opportunity to easily settle in for a unique and restful Florida hotel experience. Our spacious St. Petersburg suites combine comfort, functionality and high-speed Internet access, plus fully-equipped kitchens with refrigerator, microwave and coffee maker. Visit our St. Pete Beach Suites at the Residence Inn and discover paradise.